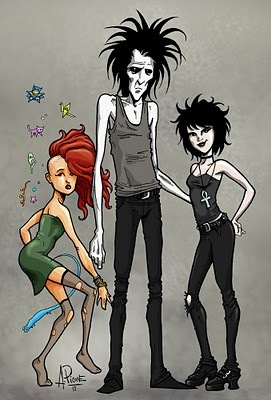 One of CCD's favorite artists Ant Stuff takes a shot at DC Comics & Neil Gaiman's The Sandman, Death and Delerium characters. They are part of "The Endless", the hierarchy of beings that govern DC's spiritual universe. Great job... The Sandman is one of my all time favorites and one of the greatest comic books ever written. Classic 90's era grunge and goth stylings. Nice work Ant!!! That middle guy looks like me in the morning when I arise from my coffin.